I know, I know: They tell you that in grad school but did I listen? Does anyone? It’s taken me years to realize the truth: That writing is hard. That it’s work. That it’s a job. (Job, noun: the work that a person does regularly to earn money; a duty, task or function; something that requires very great effort). Still, knowing all this, when I put in my notice at my newspaper editor job over a month ago, I envisioned days of pouring over thick books in the library and nights writing my own thick books at home, securely tucked away in my own little writing room. I’d write ten, no, twenty pages a day! I’d update my social media pages! I’d blog regularly and leave pithy comments on other writing blogs! I’d be a model of efficiency, and because I wouldn’t be wasting my energy (and talents) writing and editing news copy, I’d be able to save (hoard?) it all for myself. Well, the first day I did write, though not ten pages. The second day I wrote a little bit more and by the fourth and fifth days, I wrote like mad. I didn’t change my clothes, I wore the same shorts and shirt that I had slept in. I ate peanut butter straight from the jar. I didn’t wash my hair, even though I ran each day and my hair was a dirty mess. I was a dirty mess. But I was a happy, muttering-to-myself mess. Then came the sixth day, which was today. Which was a hard day (hard, hard). Every word cut. Each syllable hurt. It took me over two hours to write one paragraph, and I doubt that any of it except maybe (maybe) one small sentence is usable. And I was still a mess. I still hadn’t washed my hair and instead of eating peanut butter straight from the jar, I made and ate (in one sitting), two very large bowls of popcorn because I was stuck and writing myself into a hole, and when you write yourself into a hole the only way out is by stuffing your face (chocolate works best but we didn’t have any around). The most difficult part about writing is that it’s so personal. It’s not like solving math problems or writing computer code. There’s no filter between you and your words. Anyone reading your work can catch a glimpse inside your psyche and, if you’re writing deep and true and right, your soul. It’s scary enough making yourself vulnerable inside your own little writing room. It’s scarier still knowing that you’ll soon fling those very same words (so bare and brave and unadorned) out into the world for all to see, and judge. I believe this, which is why I haven’t washed my hair or changed my clothes in days, and why even though it hasn’t been easy, I still haven’t been able to stop writing. Or breathing. Or crying out. Or singing. My words are breathing and crying and singing–who am I, who is anyone, to try and stop them? 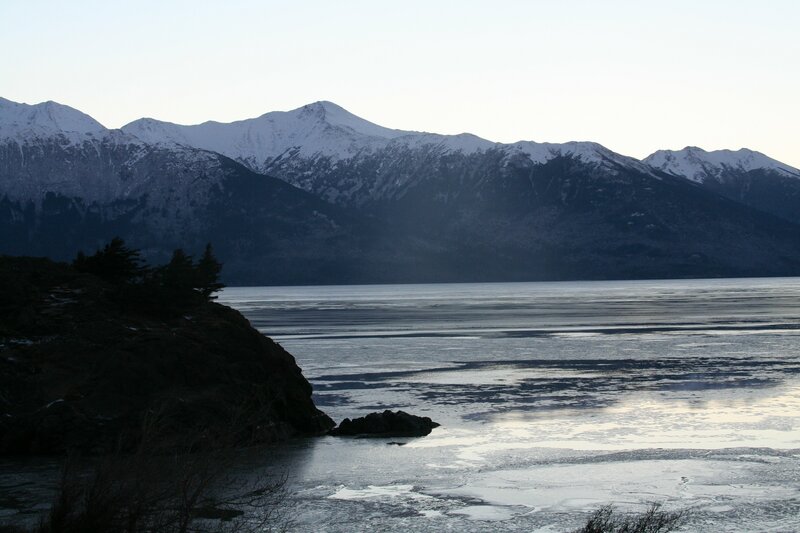 Turnagain Arm, during a recent walk with my sister. I love the moodiness of the water in the winter, when everything is silver-grey and slow. Thanks, Colleen. Anais is the best, isn’t she? Sometimes I wish I could have had tea with her, sat in the sun and chatted. Wouldn’t that have been the greatest thing? Cheers and happy writing. Thanks so much, Marie! I’m so happy that I’m back to being miserable writing, if that makes sense. Need to catch up on my blog reading. I’ll stop by soon. Until then, write on, okay? Thanks, Lynn! Love me some Ray Bradbury. Hope to catch up with you soon at writing/author events. Thanks, Kev. My job is over! I’m me again! (Sorry, got carried away.) Happy writing. Popcorn and chocolate go good together. Enjoyed your post. Funny and true. Good look writing! Thanks so much, Abby (I say as I’m once again stuffing my mouth with popcorn, lol). Thanks so much for stopping by and please keep in touch. Cheers and happy writing. When I first read about you eating peanut butter from the jar, I read it as “eating peanut butter from my hair”. I think you’re doing alright until you’re eating PB from your hair. I sometimes have problems coming up with anything that is worth reading. I delete SO MANY garbage blog posts before hitting “publish”. The moment I place the pressure on myself to get something done is the exact moment that my mind goes blank and I can’t form decent sentences….and I’m just an unpaid, hobby blogger. What you do is difficult, I’m not sure most people really understand that.